Welcome to the Residences at Kerry Parkside, serviced and managed by Shangri-La International Hotel Management Limited. 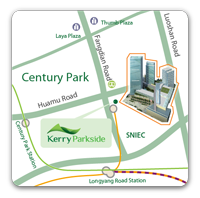 Located Centrally in Pudong, we are a part of Kerry Parkside, a 330, 000 metres square mixed-use complex which integrates serviced apartments, a retail mall, a 5-star lifestyle business hotel, and grade A offices. The Residences at Kerry Parkside enjoys easy access to a variety of vibrant retail options, including an international supermarket, a wide selection of restaurants, and services that cater to everyday needs. It is also conveniently connected to an extensive transportation network, making it easy to get around the city. Did we mention it's just a few steps away from they lush greenery of Century Park?